It's a geezer thing. We old dudes typically start losing hair in our 60s, the crowns of our heads being the first to go — hence the monks' tonsure look. In my case, beyond the narcissism issue ("Vanity of vanities, saith the preacher; all is vanity"), I developed a scalpful of dandruff not seen since my acned teenage years. "Use a shampoo containing salicylic acid three times a week," advised my dermatologist. "Rub two aspirins into my scalp and call you in the morning?" I replied, netting me an "I'm paid to take care of your skin, not listen to your dumb jokes" look. But seriously: Salicylic acid is the primary component of aspirin, or Aspirin® if you're in Mexico or Canada, where Bayer retains the trademark. This means that the story of aspirin is as old as the history of medicine. The ancient Egyptians and Sumerians used salicylic acid-rich extracts from willow leaves and bark to relieve fever and pain 4,000 years ago. Around 400 B.C., Hippocrates, the "Father of Medicine," recommended salicylic tea, while extract from willow bark (genus Salix, hence the name of the acid) was included in every physician's pharmacopoeia through the Middle Ages and beyond to treat pain, fever, inflammation, malaria, arthritis, childbirth pain, colic, gout — and probably dandruff. While salicylic acid must have seemed like an all-purpose panacea to old-time healers, they would have also known it was extremely irritating to the stomach. In 1853, French chemist Charles Gerhardt combined sodium salicylate with acetyl chloride to produce the far less irritating acetylsalicylic acid. Forty-six years later, German drug-and-dye firm Bayer capitalized on newly-developed synthesizing techniques to begin marketing acetylsalicylic acid in pill form. 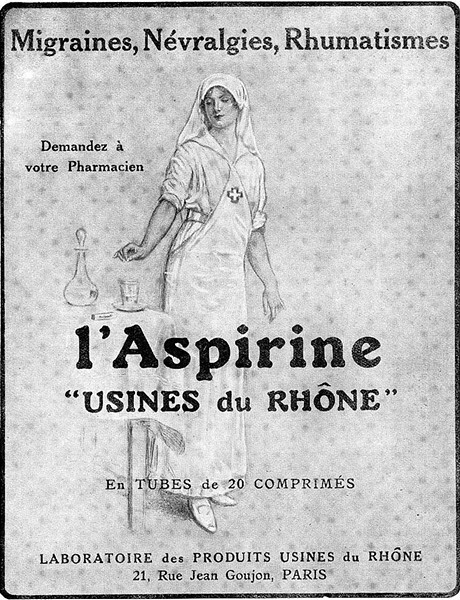 Aspirin was born. Today, aspirin is still used to treat many of the above conditions, while many of us take a buffered small dose (81 mg) daily as a prophylactic against heart attacks and strokes because it helps prevent blood clots from forming by inhibiting platelets. (The Harvard Medical School recommends chewing a full-size aspirin immediately following a heart attack.) According to Alan Jones in his book Chemistry: An Introduction for Medical and Health Sciences, UK residents ingest an average of 70 aspirin tablets annually, while the global consumption is 50 billion tablets — that's about 40,000 tons per year! (For comparison, the five locomotives trapped on our balloon track collectively weigh about 1,000 tons.) It's on the World Health Organization's "Essential Medicine" list, i.e. "those that satisfy the priority health care needs of the population." So what's not to love? Actually, a lot — aspirin still irritates the stomach and increases the risk of gastrointestinal bleeding. Adding a polymer "enteric" coating may (or may not — the jury's out) reduce this risk by delaying the pill's action until it's in the upper intestine. (Enteric comes from the Greek for intestine.) And many conditions don't take kindly to aspirin — the list is far too long to reproduce here. In case it's not obvious: None of the above constitutes medical advice. If in doubt, consult someone who really understands all this — you know, like a doctor. Meanwhile, I'm shampooing like my dermatologist advised, taking a prophylactic children's aspirin daily and appreciating the wisdom of the ancients who figured out the curative effects of willow bark way, way back in the day. Barry Evans (barryevans9@yahoo.com) is trying to take care of himself now, on the off-chance he will live long.